A novel focusing on the exploits of one of history's most notorious families: the Borgias. A sequel to 2012's Blood and Beauty. ...despite their very public lives, each of these characters has an inner story, too, and Dunant does a terrific job of showing us what makes them tick — both directly and through the eyes of Machiavelli, then an apparatchik for the city of Florence, sent to witness Cesare’s march across Italy. All in all, they’re a magnetic bunch, these Borgias ... Beyond the attraction of the characters and the history, Dunant has a great immersive style. Her hallmark is the penetrating detail ... In the end, what’s a historical novelist’s obligation to the dead? Accuracy? Empathy? Justice? Or is it only to make them live again? Dunant pays these debts with a passion that makes me want to go straight out and read all her other books. A risk of historical fiction is that the people become museum pieces, defined by their clothes, furniture and funny words. Dunant’s characters copulate, defecate and menstruate with visceral physicality; they catch colds and suffer constipation, sweat from fever, shiver from cold, and scratch at pox-scabs ... 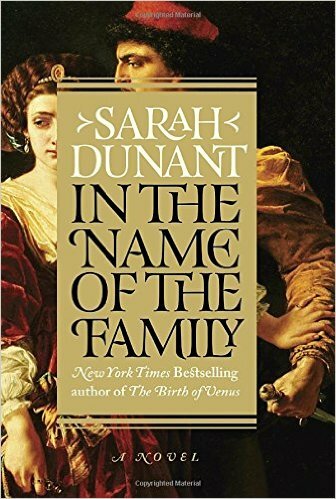 The story proceeds through a succession of tremendous set pieces, including a sea storm, a plague, the delivery of a child and various skirmishes ... Dunant, though, has made completely her own the story of Italy’s most infamous ruling family. Retaining the knack for plotting and pacing from the crime novels that began her career, she depicts history in a way that we can see, hear and smell...Identifying historical blurrings and myths about the period, Dunant’s Italian novels are an enthralling education. As the novel opens, Machiavelli travels as an envoy from Florence to Rome. Dunant deftly humanizes the man behind the classic text ... We are not quite in Hilary Mantel territory here, where descriptions of a royal court shine with subtlety and intellectual ferment. With Dunant plot is primary, and the story must keep chugging onward ... Italy's patchwork quilt of kingdoms and duchies in the period were enough to challenge any cartographer, and occasionally frustrated this reader. I could have used a map. What did you think of In the Name of the Family?